Certain election communications would be subject to disclosure under a bill heard by the Government, Military and Veterans Affairs Committee Feb. 22. Bellevue Sen. Sue Crawford, sponsor of LB839, said the bill was a revision of legislation she introduced last year. She said the bill would close a loophole in current law that allows groups to attempt to influence campaigns under the guise of providing educational materials. • are directed at the electorate of the office sought by that candidate. The definition would exclude voter guides, communications about pending legislation, candidate debates or communications by organizations to recognized members. 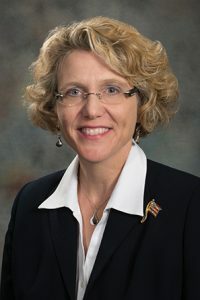 The bill would require an individual who makes an electioneering communication of more than $250 to file a report with the Nebraska Accountability and Disclosure Commission within two days. Crawford said she would bring an amendment to raise the reporting amount to $1,000 and change the time frame to cover materials distributed within 30 days of an election. Jack Gould of Common Cause Nebraska testified in favor of the bill, saying it could help protect candidates from “shadowy” organizations that run attack ads in the final days of a campaign when candidates lack the time or resources to respond. “These kinds of organizations have deep pockets and can attack at any time and destroy someone’s character,” Gould said, adding that the bill would require reporting from these organizations without infringing on their free speech rights. Also testifying in support was Frank Daley, executive director of the Nebraska Accountability and Disclosure Commission. He said the bill would ensure that activity that is identical in purpose is treated substantially the same under the state’s campaign laws. For example, he said, a mailer about a candidate that mentions the upcoming election or suggests voting for the candidate must report to the commission. One that does not mention the election or suggest voting for the candidate—but contains all the same information otherwise—does not. Currently, he said, there is nothing about the second mailer that is reportable under Nebraska law. “The purpose [of LB839] is to disclose who’s talking, who they’re talking about and how much they spent,” Daley said. No one testified in opposition and the committee took no immediate action on the bill.